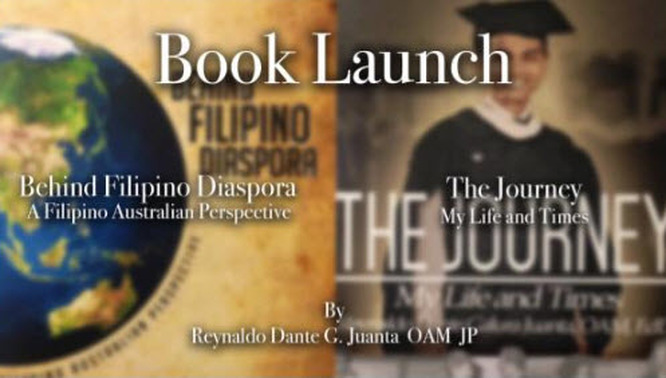 Dr Reynaldo Dante G Juanta OAM, Retired Philippine Honorary Consul General in South Australia (SA), Australian Justice of the Peace (JP), Visiting Professor in Philippine Normal University Manila, has recently written two great books. These books provide a great personal history of the life and times of a migrant Filipino to Australia, as well as a more general perspective social, political and economic perspective of Filipino migrants to other countries. This was recently launched with great fanfare in Adelaide, the capital city of SA. South Australian Minister for Multicultural Affairs, the Hon. Zoe Bettison MP officially launched 2 latest books by Dr Reynaldo Dante G. Juanta OAM at a special ceremony held at St John Catholic School Centre, Plympton on 10 September 2016 attended by more than 160 community members including Members of Federal and State parliaments, the clergy, academics, medical fraternity, consular corps, ethnic media, multicultural services, volunteer ethnic organizations, family members and friends.